This is too easy. All you gotta do is show up. Indie-folkers The Parson Red Heads hold down their February Monday residency at McMenamins White Eagle Saloon with The Olive Grove and Eric Earley (Blitzen Trapper), 8:30 PM. 21 and over. Portland Cello Project's Skip vonKuske holds down McMenamins Edgefield with Charlie Nanos, 7 PM. 21 and over. Funky jam band rock with Tree Frogs at at LaurelThirst Public House at 9 PM. 21 and over. Whiskey stomp, indie folk with The Ascetic Junkies as they continue their February Wednesday residency at LaurelThirst Public House with special guest The Glyptodons, 6 PM. 21 and over. Unfiltered: Indie-Rock Showcase with Pine Language, A Season of Tanagers, and Dust Bowl Holler (All-Star Tribute to Tom Waits featuring members of The Breeders, Drunken Prayer and Buoy LaRue) at McMenamins White Eagle Saloon, 8:30 PM. 21 and over. 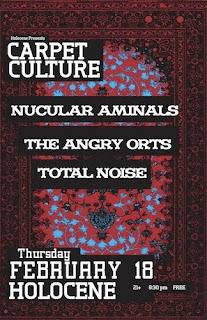 Carpet Culture at Holocene with indie stuffs from Nucular Aminals, The Angry Orts, and Total Noise, 8:30 PM. 21 and over. Roots with Blue Turtle Seduction as they make the rounds when McMenamins' Great Northwest Music Tour comes to Edgefield, 7 PM. 21 and over. Night Shift 70's, 80's and on... DJ dance party with Remy the Restless, Lamar Leroy, Standing 8, and with special guest Moonchild at Someday Lounge, 9:30 PM. 21 and over. Pure, unadulterated 80's with DJ Gregarious at Berbati's Back to the Future, 10 PM. 21 and over. Roots country with The Low Bones at East Burn, 5 PM. All ages. David Ornette Cherry lays down an intimate set at Music Millennium at 3 PM. All ages.